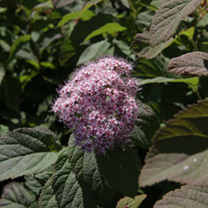 Superstar Spirea features showy clusters of pink flowers at the ends of the branches from late spring to late summer, which emerge from distinctive purple flower buds. It has attractive dark green foliage which emerges scarlet in spring. The small serrated pointy leaves are ornamentally significant and turn an outstanding coppery-bronze in the autumn. This is an exciting smaller, naturally dwarf spirea that requires minimal pruning; new leaves start out scarlet, becoming dark green, then change to a brilliant bronze in the autumn. Height 150-200cm. Supplied in a 3 litre pot.